Or pickles. So in honor of this movie I’m trying out a long-planned jar of pickled green tomatoes, something I remember with fondness and bemusement from my childhood. Whenever my grandparents would come down to Virginia to visit us, they’d schlep bags stuffed with good tough breads, real bagels, packets of corned beef and pastrami. Along with precariously packed containers–were they plastic tubs, or were they, as I remember, merely stapled glassine bags of half-sour kosher dill pickles, with traces of brine and garlic bits sloshing around in them? You’d never be allowed to carry that on an airplane these days. And tucked into the brown-paper shopping bags another container of similarly pickled unripe tomatoes, an older, less-well-known classic with no equivalent in my mainstream suburban childhood. 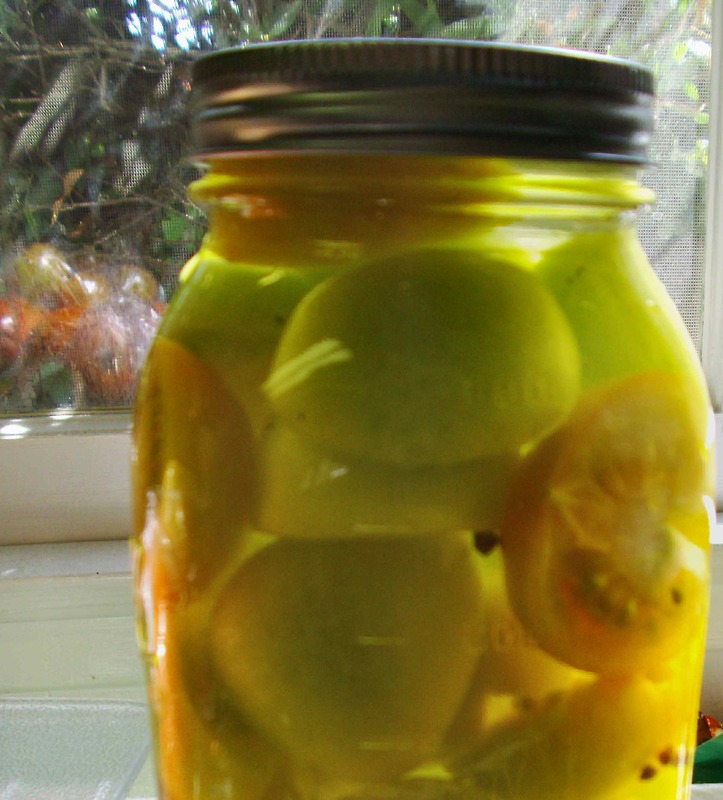 Nu–I’ve just sterilized a jar and picked a pound of still-green small tomatoes out of the bins at my local Armenian greengrocer’s for this, so wish me luck (loose recipe at the bottom of the post). So, the last question or two is, how did this documentary come about, and how are they doing so far? Deli Man is the third in a series of documentaries on Jewish culture by director Erik Greenberg Anjou. He met Gruber in Houston when Gruber’s deli, Kenny & Ziggy’s, sponsored a screening of one of the earlier films. He immediately decided Gruber’s story had to be next. Anjou and his crew funded Deli Man with a Kickstarter campaign that asked for a mere $54,000 and got it pretty quickly. I’d guess they must have had other funding too because the production values are professionally high and they cover more than ten locations, but there are just four crew members including Anjou himself. In any case, in just under a month of theater openings, they’ve cleared more than $300,000, which is pretty promising, and with luck it’ll continue to pick up steam. So nu, that’s more or less it. I’m done hocking and I’m not giving away any more surprises about the movie and the character arc, you’re just gonna have to see it for yourself to find out what happens with Mr. Gruber. Trust me, it’s worth it. Instead, I’m going to skip ahead to the credits, because they contained a personal surprise for me: Lorin Sklamberg of the Klezmatics (and sound archivist for the YIVO Institute for Jewish Research) does the music. He has collaborated with musicians from Itzhak Perlman to Emmylou Harris and is very good indeed. Wash the mason jar and lid parts well, then stand them in a big pot or metal bowl and pour boiling water over and in them to sterilize. Let stand a bit, then carefully (with a rubber glove or potholders) pour out the water from the jar and let air-dry on clean toweling or tilted upside down in the bowl. Boil the liter of water and add salt, stir to dissolve, then add the vinegar and cool (I stuck the saucepan into a large bowl with icewater for 10-20 minutes). Meanwhile, wash the tomatoes well, rinse thoroughly and let them dry in a colander. Wash the dill and put it with the peppercorns and coriander seeds in the bottom of the mason jar. Peel and cut the garlic cloves in halves and put them in too. Cut each tomato in halves or quarters, depending on how big they are–you want pieces that are 1 inch thick or so, so for green Roma or medium round tomatoes you’d want quarters; for large cherry tomatoes just cut them in half. Place the tomatoes in the jar with the dill and spices, using a spoon to help push them into any empty spaces. Pour the cooled brine over them, tapping the jar gently on the counter every so often to bring up any hidden air bubbles, and fill to the rim. Put the lid and collar on tightly, turn the jar over and back a couple of times to make sure the brine gets everywhere (inside the jar, I mean–hopefully no major leaks!) and store the jar in a cool darkish spot on the kitchen counter for 2-3 days to ferment (some bubbles should form at the top). Then store in the fridge and use within a week or so–half-sour dill-style pickles, whether tomato or cucumber, don’t store on the shelf and they don’t last quite as long as the standard boiled-in-vinegar-and-tons-of-salt type. On the plus side, they’re fresher-tasting and crunchier, and more about the dill and garlic. And yeah, I know; a liter of pickled tomatoes is kind of a lot to use within a week except if you’ve got a largeish household or a party to bring them to. So just do a pint jar with half the amounts of brine and so on if that makes you feel better. Or turn the excess pickled green tomatoes into the base for a green tomatillo-style salsa. B’te’avon–eat nice! And happy Pesach (or Easter weekend) next Friday!